Galenus is a publication aimed at informing physicians and pharmacists about the latest scientific news in pharmacotherapy, phytopharmacy, medical and pharmaceutical practice, nutrition and pharmacy, dentistry, phytotherapy, toxicology, etc. The magazine is accredited by OAMGMAMR and OBBCSSR, and is approved by the National College of Pharmacists – as a result, subscribers receive 10 EFC credits. After subscription, physicians receive 5 CME credits, while physicians whose articles are published in the printed version of Galenus magazine receive 15 CME credits. Galenus is supervised by CNCS (National Council of Scientific Research). It has 76 pages and is distributed solely by subscription (yearly subscription price: 80 RON). It is published in 10,000 copies. 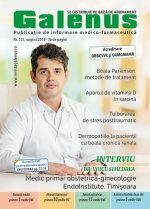 Farmacia Ta is the first Romanian magazine dedicated to health topics. It addresses a general audience of all ages. It is published in 285,000 copies and it can be bought from press distribution points (40% of circulation), while also being available free of charge in pharmacies and health centers, in Bucharest and nationwide. Over 800,000 readers go through the pages of Farmacia Ta. It has 100 pages, A5 format, and it costs 4 lei. Tonica by Catena is a colorful and charming magazine approaching topics that address the modern women in the urban areas who invest time and money in their image, their health and the one of their family and friends, having local celebrities as role model and constant source of inspiration. It has 100 pages, and it costs 7 RON. It is published in 15,000 copies. Slab sau Gras is the first and only monthly magazine for weight loss. It contains diets, recipes, healthy nutrition tips and is dedicated to readers of all shapes and sizes. Each month, in Slab sau Gras you will find interesting articles about celebrities and their weight loss/weight gain regimes and healthy lifestyle secrets, informative articles written by renown nutritionists and dieticians, and the latest news in the field. Well-trained fitness and bodybuilding coaches recommend each month the most effective routines and exercises for a well-balanced body. Slab sau Gras respects its readers, providing, on a monthly basis, practical solutions for a healthy lifestyle. It has 76 pages, and it costs 7 RON. It is published in 15,000 copies. SexSafe aims to provide the latest information in the domain of sexual education, its target audience being teenagers, young people and adults. Sexsafe.ro approaches topics on sexuality and sexual activity, relying on the help and advice of professionals. As a result, it collaborates with professionals in the medical, pharmaceutical and psychology fields. Sexsafe.ro provides its users an interactive section where they can get fast answers to their questions from specialists. SENSO TV – The online television Sensotv.ro is an extensive collection of videos covering in detail the three main aspects of life: arts, health, and lifestyle. If online television is the future of television, then Sensotv.ro aims to represent the valuable, authentic and wholesome Romanian spirit. SENSO TV / ARTS – Sensotv.ro/arts reveals a world filled with strong feelings and emotions, remarkable talents and warm souls. This channel delivers the latest exhibitions, performances, book launches, documentaries, interviews with famous artists and movie premieres. 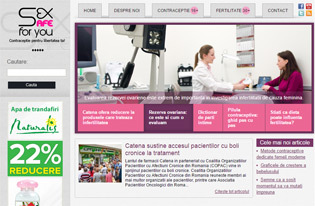 SENSO TV / HEALTH – Sensotv.ro/health welcomes visitors with the latest information form the medical world. Reportages target risk factors for certain diseases and the most effective methods of prevention and treatment, campaigns and important events, interviews with personalities from the medical field and weight loss contest for visitors interested in adopting a healthy lifestyle. SENSO TV / LIFESTYLE – Sensotv.ro/lifestyle welcomes visitors with a collection of stories about beauty, fashion, sports, food, hobbies and tourist destinations. It is your daily source of inspiration for a life filled with satisfactions, delivering the coordinates within which we can each tailor a lifestyle to our own liking.